Mainland China reportedly will unlikely extend duty-free grace period on Taiwan-made machine tools. Citing unnamed sources, the Chinese-language Economic Daily News (EDN) reports that mainland China is unlikely to extend a tariff-exempt grace period on Taiwan-made machine tools destined for the mainland market, despite pleas by Taiwanese makers who wish to be allowed another five years through the trade-in-goods talks between Taiwan and the mainland. The mainland granted the duty-free treatment to all Taiwan-made, high-end and mid-range lathes bound for the mainland five years ago, according to an article in the Economic Cooperation Framework Agreement (ECFA) signed between the two sides of the Taiwan Strait. Nevertheless, the article also stipulates that these machines will be subject to a 9.7 percent tax beginning the first day of 2016 if they still fail to adopt controllers either made in Taiwan or the mainland. After a recent session of the trade-in-goods talks, Director General M.J. Wu of the Industrial Development Bureau, the Ministry of Economic Affairs (MOEA) has basically put the writing on the wall to spell out the uphill battle for Taiwanese machine tool makers regarding the mainland Chinese market. He says although the disagreement between the island and the mainland over some technical issues has scaled down, the mainland remains adamant towards protecting its homegrown machine-tool, flat-panel, petrochemical, and automotive industries, which China designate as its pivotal industries that call for exigent development. Chairman B.X. Ke of the Taiwan Association of Machinery Industry (TAMI), which represents nearly 3,000 local machinery builders including machine-tool makers, concedes that the island's high-end machine tools still are not completely outfitted with locally-made controllers, to also indirectly admit to the relatively inferior state of technological development on the island. Japanese and German suppliers remain the major controller sources for the island's machine tools. 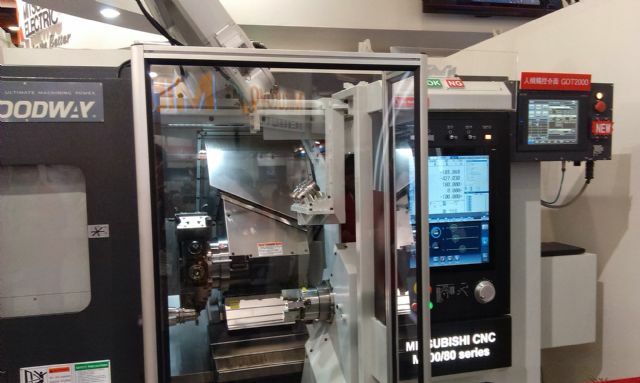 Mainland China, besides absorbing some 40 percent of Taiwanese exports, is the largest export destination for Taiwan's machine tools at 30-plus percent of such items. Paying duty is not the only burden saddling Taiwan's machine-tool makers when selling products to the mainland, Ke notes. The mainland has signed Free Trade Agreement (FTA) with South Korea, whose machine-tool makers are taking advantage of the weaker won-to-greenback rate relative to the NT-dollar to encroach on the market share of their Taiwanese competitors. IDB's Wu points out that the trade-in-goods talks totally differ from FTA because the talks involve not just the duty-exempt issue but also whether Taiwan should lift the import ban on over 800 China-grown agricultural products, which makes the talks more complicated than FTA. He says the talks on granting duty-free treatment to Taiwan-made flat panels are also not optimistic. The mainland is collecting a five to eight percent duty on Taiwan's flat-panel display makers. Eight years from now, the mainland will allow South Korean makers to export duty-free such displays to China according to their FTA deal. Wu says although Taiwan's negotiators in the talks tried very hard to convince their mainland counterparts to offer better terms to Taiwan's flat-panel makers than those being tabled to the South Korean makers, they returned empty handed.